It is with great sorrow that I have to report of the demise of my dear friend Ann Skipper, who had been suffering from Alzheimer’s for some years and sustained a severe stroke late last December. She was eighty four and passed away on the 30th December. The humility and lack of fanfare typical of the family resulted in my not discovering the truth of it until now, June 2010. 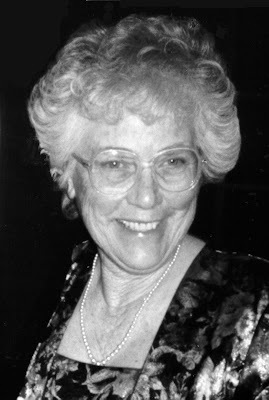 After a very full life raising four boys as the wife of a schoolteacher, Ann took up Scottish Country Dancing, and became an accomplished teacher in the late 1970s. In 1983, Ann and I met at a Highland Games in Costa Mesa as a result of an introduction made by the Broadcaster Tom Girvin. She rapidly endeared herself to me and inspired me to take up Scottish Country Dancing. From that point on Scottish country dancing was a regular activity in the Clan MacLeod Society in Southern California. Together we started a dance team who came with us to the Clan MacLeod Parliaments in 1986, and 1990. In 1986 we published our first book on Scottish Country Dances that relate to the Clan MacLeod, it was called “Dances of An Island Clan”. This book was really successful and helped to inspire lots of McLeod’s across America and beyond to take up Scottish Country Dancing, and five teams were formed in the United States. Here in California the McLeod Rant was one of the most successful dances held each year. Ann and I continued to gather dances related to the Clan and for the next 10 years worked on producing another book. As the dance teams were formed, Ann took over their coordination and became the Dance Mistress to the Clan MacLeod. In 1991 the “Ghillie Guide” was published, a small booklet with a wealth of information on the nuances of dance steps, figures and terminology needed to understand the many dances we were discovering. As dancing became popular at Clan ceilidhs Mrs. Skipper met the need for simple dances for these occasions and published “Clan MacLeod Dances For Ceilidhs” in 1993. A year later in 1994, “If the Ghille Fits…” was published, and together with“Dances of An Island Clan” it makes a unique repository of knowledge of Clan MacLeod dances and history. It is not possible to begin to communicate the extent of the commitment and devotion Ann Skipper directed to her labors on behalf of Scottish Country Dancing, and especially to the Clan MacLeod. She was inspired in the Milligan tradition and was tireless in her work. Her academic research resulted in her readership at the Huntington Library here in San Marino, California. In 2000, as if to welcome the new Millennium, Ann published her crowning glory “Best Foot Forwards” a collection of twelve of her own dances each designed to emphasize a particular dance figure she wanted to teach. This little booklet alone represents an enormous amount of work, and places her in the ranks of the great Scottish Country Dance choreographers of the twentieth century, many of whom she new personally. Her four sons Tim, Andy, Brian and Paul, her husband Peter, the many grand children and a myriad of dancers around the world will mourn the loss of this “best of mothers and wonderful American lady” who is much loved. It’s the notion of how much I’d lack if I weren’t here that daunts. But though I’ve loved them all at times, I do not call them home. Few natural wonders impress like Iguacu Water Fall. With the most amazing creatures in the waters underneath. But when I’m done I’m headed back to claim the greatest pearl. Doubt not that I’ll be back again, America I sing. 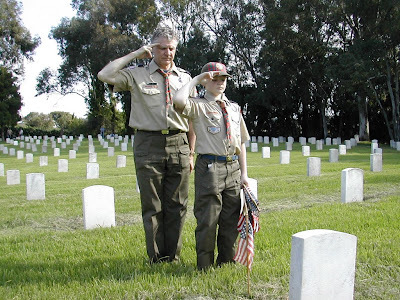 On Memorial Day the Boy Scouts help us remember the fallen by planting flags on each grave in our National Cemeteries. Although this picture taken with my son is a few years old now, it captures the sentiment of what we value most and what needs to be treasured in this great country the USA.